Katie Bohannon | Photo courtesy Resource One. 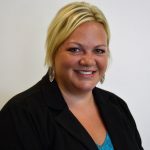 Katie Bohannon joined Resource One Interior Solutions & Design last week as furniture project manager. Bohannon will manage large projects involving logistics planning, installation and other duties. She most recently worked at her family’s business and previously in facility design at Horace Mann. “Her goal will be to delight our clients with a seamless project,” said Resource One president Cindy Davis.